When trying to create a balanced healthy meal we may overthink it from time to time. How many grams of protein should I get? Should I eat fat or not have any? Are carbohydrates evil? If you are trying to improve your overall nutrition habits my suggestion is to not focus on numbers in the beginning (you don’t need to count calories or macros). Instead just visualize your plate and put the right portions for your health and fitness goals. Most of us Americans tend to put more processed carbohydrates and sweets on our plates and less proteins and vegetables; this should be reversed, aka MORE protein and veggies and less processed carbs. Many folks are also afraid of fat…the truth is healthy fats (avocados, nuts, olive oil etc) doesn’t make you fat. Have you ever heard anyone say “wow I really ate too many avocados this week it made me gain 5 pounds!” Nope. However we all know when we indulge on chips, cookies, ice cream and all the things that is when we tend to see the scale creep up. So don’t be scared from fats they are vital to support your cholesterol and hormone production! 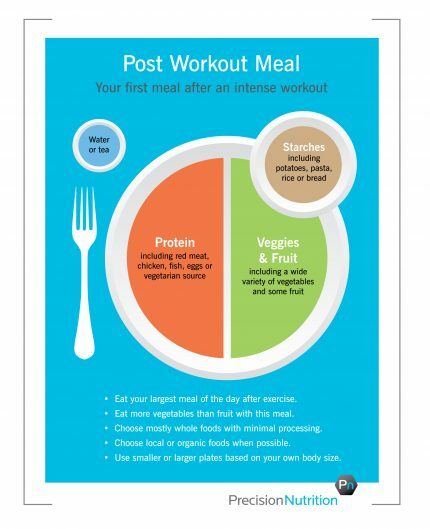 I really like the Precision Nutrition’s Anytime Plate and Post Workout Plate. 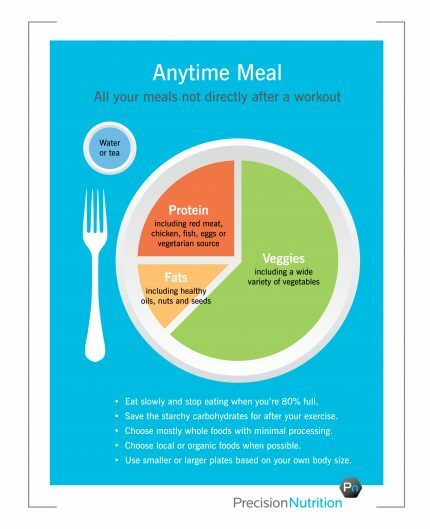 This is an easy visual on what portions to get in and even at what times of day (depending on if you have exercised or not). 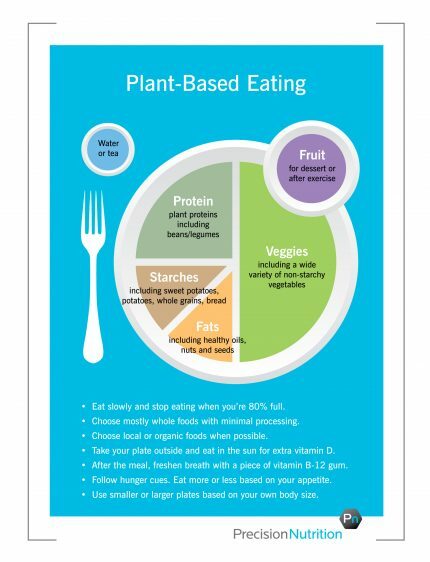 Take a look below, they even have one for all you plant eaters out there! You will notice that for the “Anytime Meal” it consists of protein, veggies and fats-note minimal carbohydrates; this is especially helpful for those wanting to loose weight. For the “Post Workout Meal” fats are limited and carbs are added. After exercise our muscles are most receptive to utilizing carbs (glucose) for energy and rebuilding muscle therefore it is important to get in carbs post workout. Try to stick with whole food carbs as much as possible: fruits, potatoes, plantains, rice, etc. IF you are planning on indulging on a sweet treat it can be helpful to time it after a workout so your body will be more likely to store it in your muscles rather than excess fat. When whipping up your next plate at home or even ordering out take a gander at these plates and try to make your meal look similar. This practice requires no counting and is very straight forward and simple to implement into a daily routine!